During the last couple of weeks we have stayed mostly at Slab City but did make a final run back to Yuma because Doug’s glasses needed to be fixed again. I think it’s a fluke because we have never had any issue with glasses purchased in Mexico. When we got back to Yuma most everyone we knew had returned home, so the place was pretty empty. 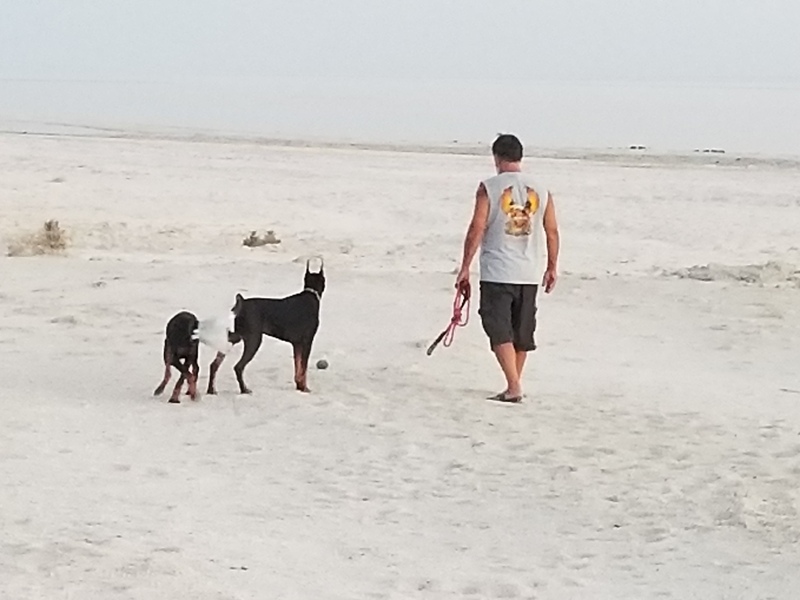 Today we parked along the Salton Sea so the girls could enjoy a day or so without being tied on leashes. They sure love it there! So do we! 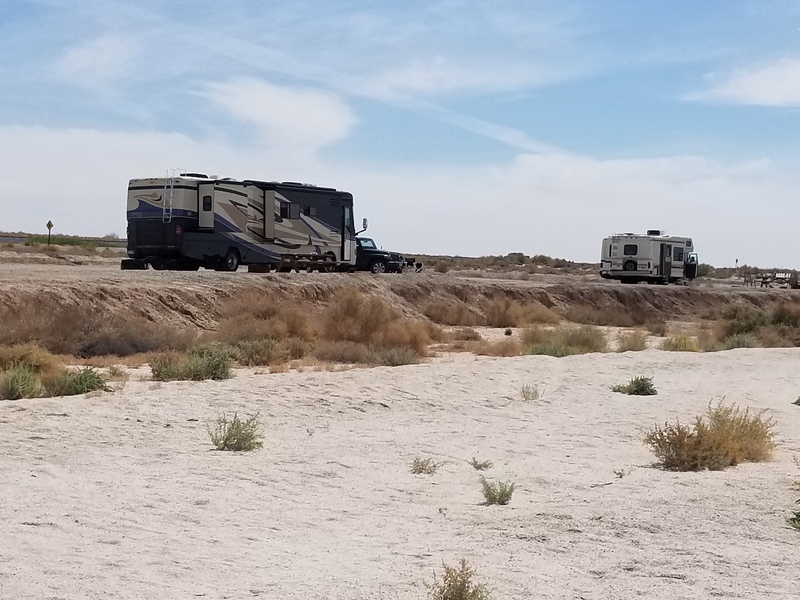 There are State camp grounds along the sea, an d some places just off of the main road where you can park for $8.00 a night. People say the Sea stinks… it’s no where near what it smells like when you board the Ferry’s in Canada to go out to Vancouver Island. We have been there when the sea weed…. if that’s what you call it, rises and the the area fills with a kazillion flies, which in turn become a feeding ground for migratory birds. We have noticed, during this time, there is a smell to the sea that can be unpleasant. Other than that, people Kayak on the sea, and most just enjoy feeling the cool breeze and taking walks along the shores. 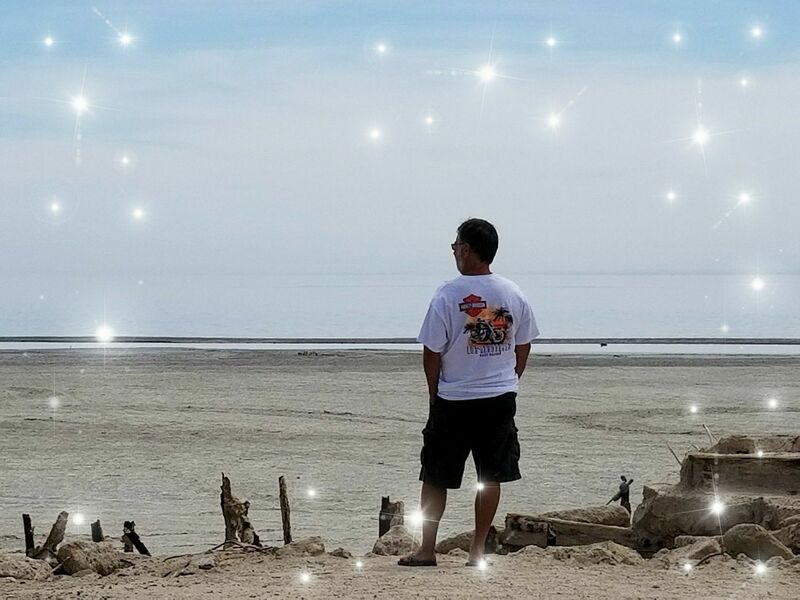 It’s pea ceful I hope the state of California gets their act together and fixes the mess they have created before the Salton is lost forever! 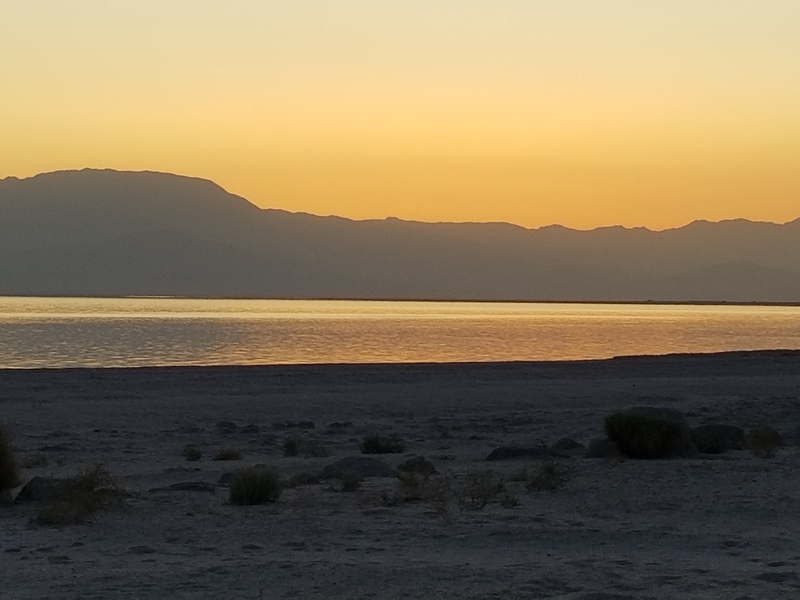 The sunsets over the Salton are amazing. I’ve seen a ton of different shades of oranges and such, but here they are gold. Seriously…. gold. Stunning! 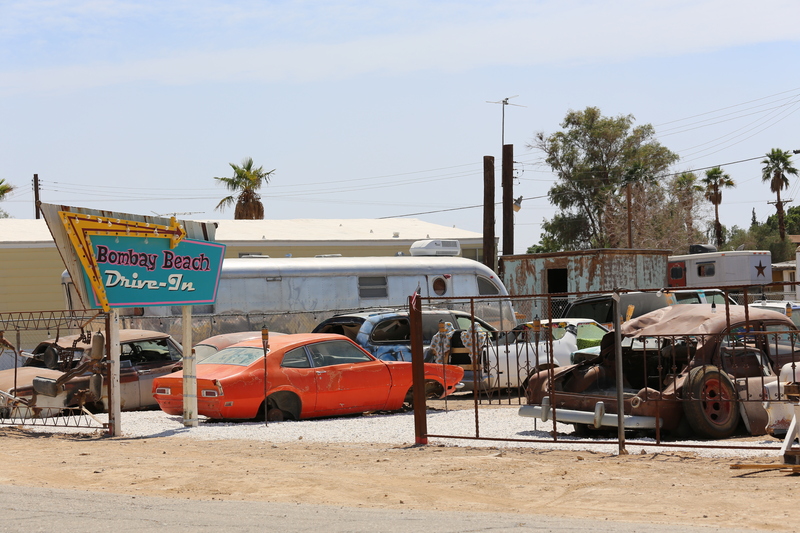 Just down the highway towards the Slabs is a town called BomBay Beach. We have passed it numerous times, but I wanted to grab my camera gear and go scout around. 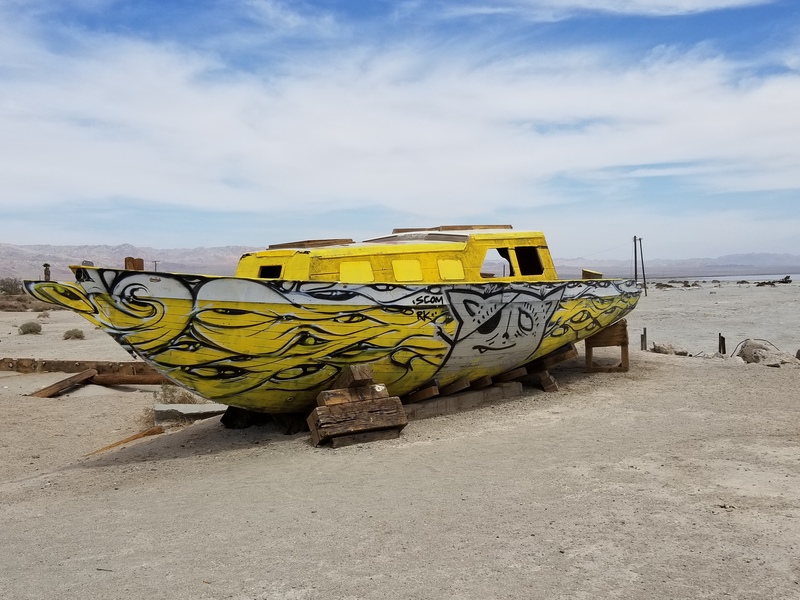 During the 60’s the Salton Sea attracted more than a million tourists. The Sea was a booming area and a play ground for the rich and famous. 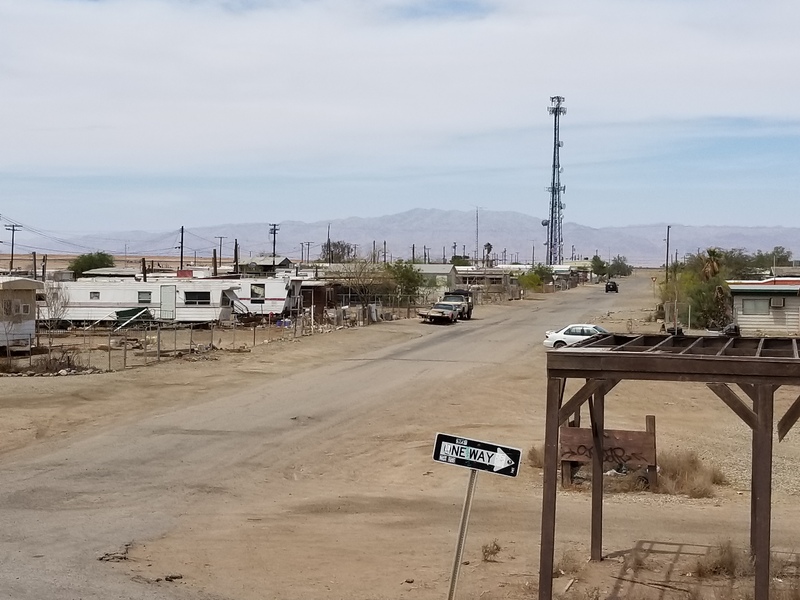 Housing communities were beginning to develop along the south shores, and Bombay along with Brawley and places like Niland were teaming with tourists and business was brisk. That all ended when they re-directed the Colorado River, and farmers poured their chemical waste and pesticides into the water. Thus, man did indeed kill a sea. Along with that, the towns and businesses in the area gradually became ghost towns. Bombay is one of those towns. The old billboards from the 60’s that are torn and tattered from years of sun, still dot the highways. When we drove into Bombay, you could imagine what a vibrant and bustling place it once was. 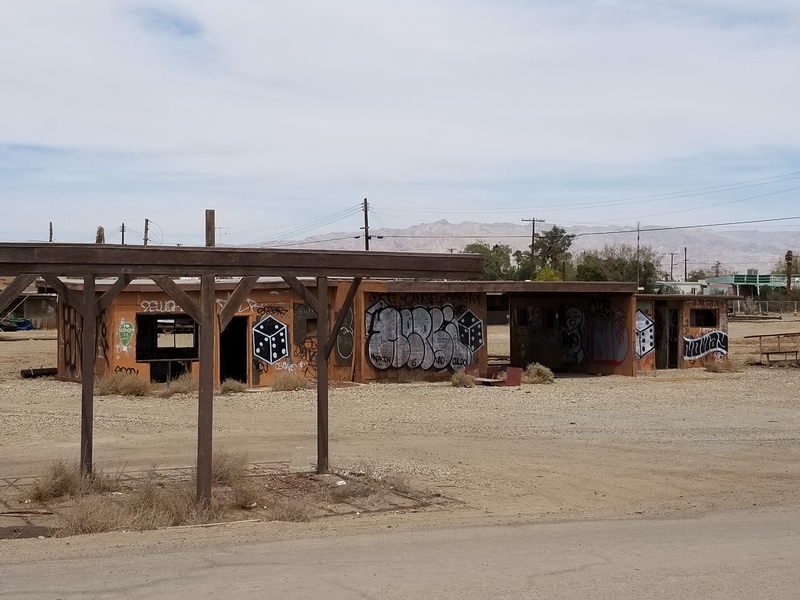 Now the land is littered with the ghosts of homes and businesses that are crumbling and covered in graffiti. Sort of broke my heart. There are a few people that still live there. Most of the current homes are old mobiles, and many have fallen into decay. There are a few homes there that are really quite beautiful. 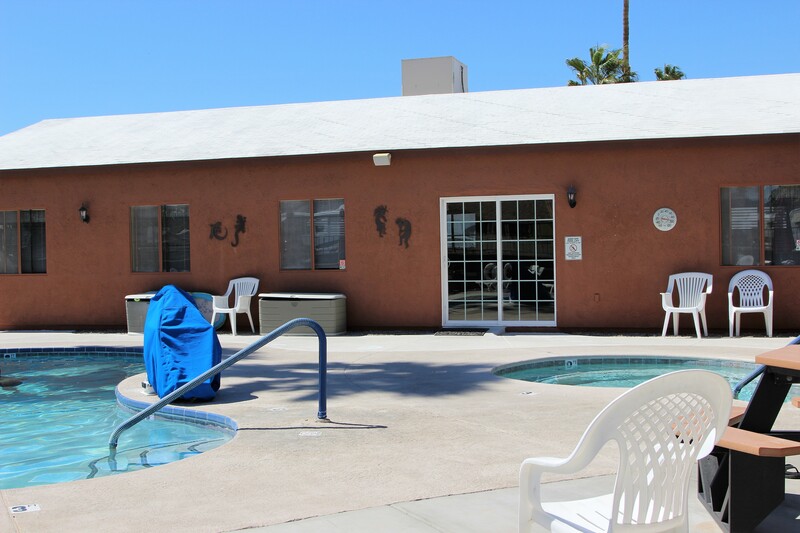 The owners have taken a great deal of care to decorate the yards in art work and cactus plants. There is a general store of such, and a bar. Other than that, the rest is really up to your imagination to visualize what it must have looked like at one time. In the center of town, we found something really unique. People had taken an empty lot, and pulled in all sorts of old cars and trucks, and lined them up to make a Drive In Theatre. It’s amazing. They are all arranged in neat rows, facing a semi trailer that looks like a big screen. Weeds, desert brush and small vines have grown in all of the cars and have wrapped themselves around steering wheels and pike through broken windows. Someone even set up tiki torches down the aisles to make it look like the old speak boxes. We parked the motor home on the side of the road, and Doug went on top of the roof to grab some photos. The old Bombay Drive In sign is still standing and it’s brilliant colours add to the historical ambience you feel as you wander around and look at all of the various relics. Each one, in my opinion is beautiful. Between the sun, sand and wind, the different shades of rust and tattered interiors are fascinating. A photographers dream really! Then we made our way to the Sea. Or what is left of the shore line. Once you park you have to walk quite a ways to get to see what is left of the huge piers and boat slips. The skeletons of boats and larger yachts raise their weathered ribs to the sun as a latent reminder of what once was. If you close your eyes, you can almost hear the dance halls pounding with jazz music, and hear hoards of people mulling through the now desolate streets. It’s sort of a weird feeling to walk around and see the remnants of what was a thriving and vibrant community. On our way out, we stopped off at the local bar or pup. Once inside, I thought it was a really cool place! The staff there are amazing, and in no time at all once we had taken our seats at the old wood tables, local residents made us feel welcome. 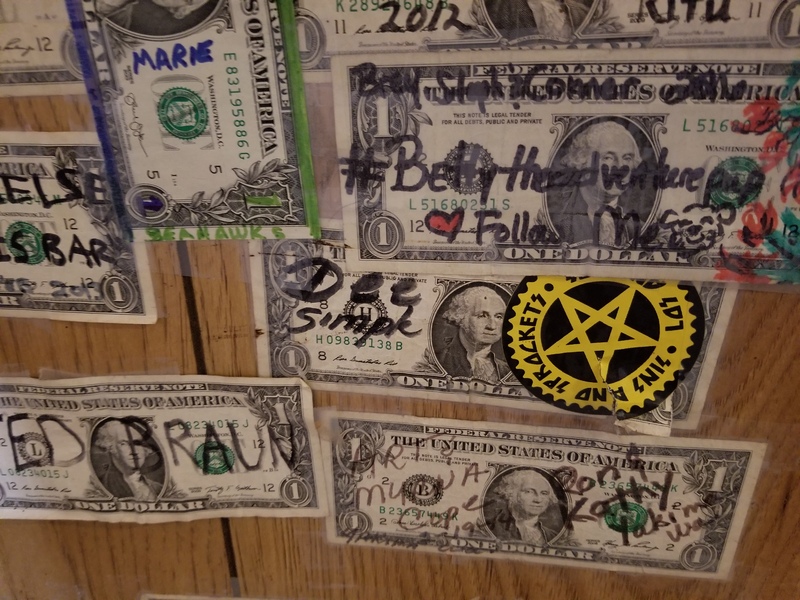 After we had ordered something to eat, I wandered around the bar and read the names and dates of past visitors that had signed and tacked paper money all over the roof and walls. Some of the bills dated decades back. I’ve seen this before in pubs back home in small towns, but never as much or as interesting as this was. I could spend an hour or two in there just reading customer comments and notes left over the years. On a side note….. the food was fantastic! The menu is priced right, service is great, and the outside patio at the back has fire tables, and is beautifully shaded and decorated! 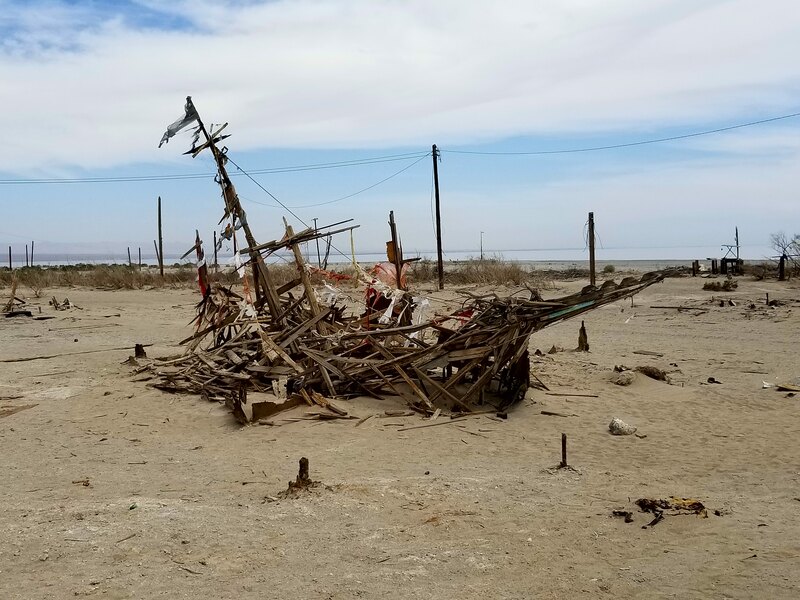 I would honestly recommend anyone in the area of the Salton Sea to pop into the town of Bombay. Glad we took the time to visit. Sherry, Doug, Chicago and Journey. You make me want to visit the site. 🙂 It really is cool Wanda…. so much history… I have photos I want to get up once this is all up to date… the desolate areas around the Salton are very very very interesting. Love ya girl… Hi to Ken… take care!